After experiencing a disappointing 2014, the Phoenix new home market steadily improved throughout 2015—and the positive momentum has carried into this year. 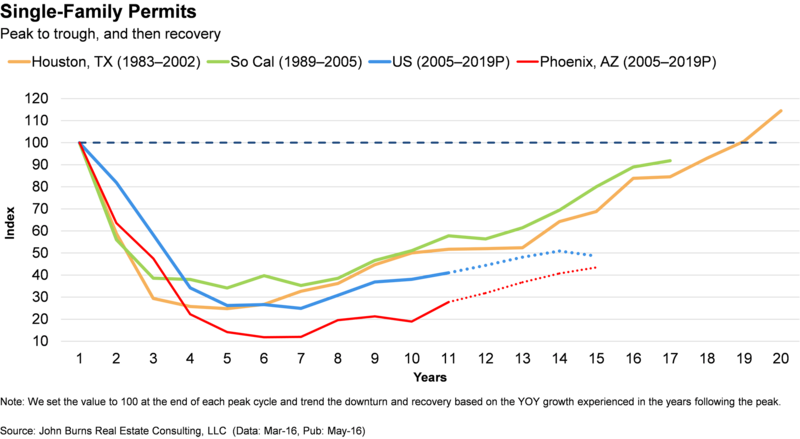 Buyer demand increased sharply over the past year and a half, with builders experiencing rising net sales per community. Net prices finally stabilized in mid-2015 and trended upward after some softening, marked by increasing incentives in 2014. Single-family permits have climbed steadily over the past 13 months, with positive month-over-month growth for the past 16 months. Builders increased community counts 6% year over year as of 1Q16. The increase results from both public and private builders ramping up their total number of open communities. Despite the increase in community counts, builders continue to maintain steady absorption rates through the first quarter of 2016, with most communities selling between 3 and 4 net homes per month according to our most recent builder survey. Phoenix single-family permit activity declined at a historic rate after the housing bubble burst in 2007, falling from a peak of nearly 61,000 units in 2006 to just 7,200 in 2010. The decline represented a nearly 90% drop in new home construction activity during the Great Recession. In comparison, national single-family permit activity (which is heavily impacted by major new home construction markets such as Phoenix) declined 75%. Despite Phoenix’s new home market having performed below expectations in 2014, the metro area’s single-family permits recovered faster than the nation, rising 144% from the trough compared to 69% for the nation as a whole. 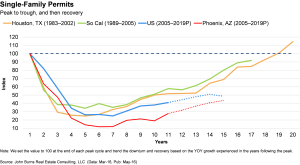 The current US housing cycle is mirroring that of the cycles experienced in the recessions in Houston in the 1980s and Southern California in the 1990s: four years of falling single-family permit activity, three years of relatively flat issuance, and then an increase in permits. As shown below, Phoenix followed the same trend for the first seven years but has fared better than the overall national trend over the past four years. 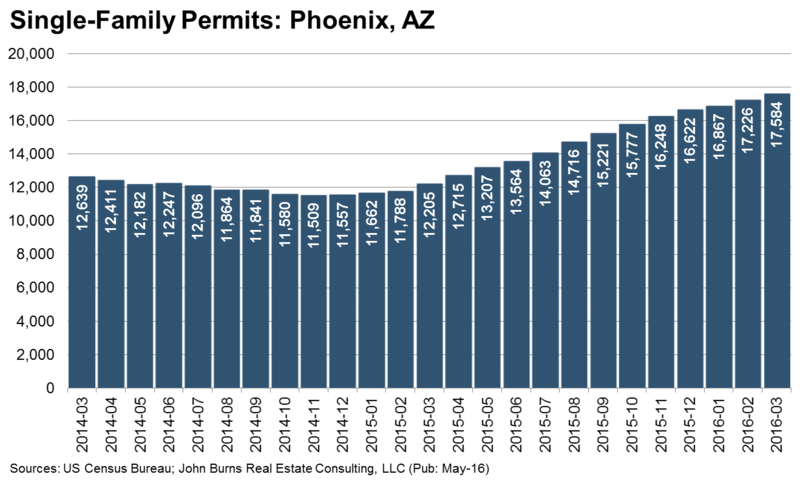 We forecast steady permit growth in Phoenix through 2019. Since mid-2015, solid jobs growth has driven the strong demand for housing in Phoenix. Rolling year-over-year employment growth has been in the 3% to 4% range for the past year, translating into nearly 70K added jobs over the past 12 months. Total employment of 1.97M finally has surpassed the previous peak of 1.95M reached in December 2007. As total employment continues to reach new highs, we expect the Phoenix economy to continue to thrive, which will provide supporting tailwinds for its new home market. 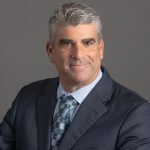 If you are interested in more details about our Phoenix forecasts and reports, please feel free to reach out to Ken Perlman at kperlman@realestateconsulting.com.